Casey was kind enough to put this story to words for me to share on the blog. He handed it to me nicely written out on sheets of binder paper in his bold and neat penmanship. Of course I typed it up and made a few corrections, but he did a wonderful job and I hope you enjoy Part 2 – Quinn’s Turn! It was well after dark before we started up that shale rock trail and back to camp that night. Even through the darkness and glare of her headlamp I could see a look of disappointment on Quinn’s face and I knew exactly how she felt. It had nothing to do with the fact that her Brother had been successful. She was sincerely happy and proud of him. It was really because of the anticlimactic result of what we thought was a well laid out plan. We all truly thought that our patience and persistence would have ended with that group of bulls coming out to feed and Cade and Quinn each having ample time to choose their bull and take a shot. But what we hadn’t expected was the disruption of those hunters road, hunting from their quads. 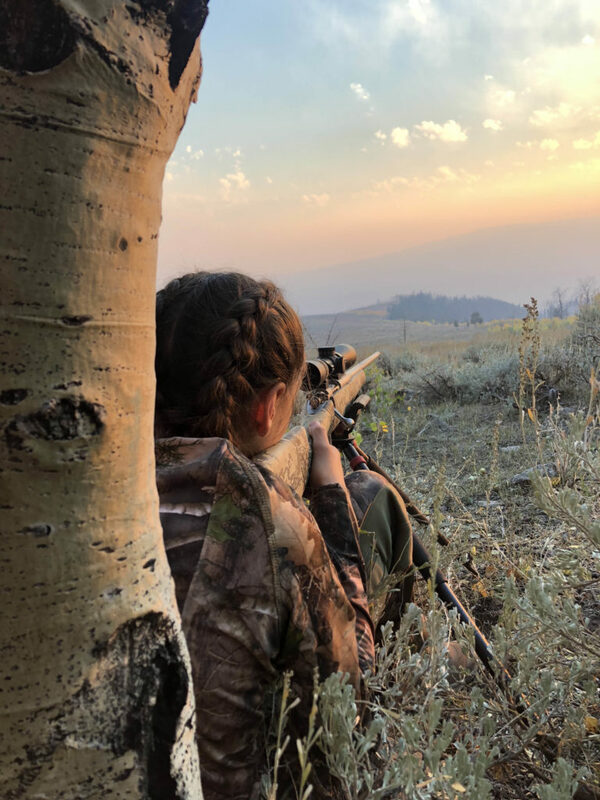 Welcome to public land hunting, Sister! Quinn and I chatted as we marched through the dark to the truck. I assured her that her Mom, Tom, and I would do whatever it took to find her a bull. I meant it, and she knew that. It was early morning by the time we made it back to camp. Cade and Regina, jumped straight into their bunks, while Quinn, Tom and I enjoyed a couple instant Mac n Cheese bowls to hold us over for a bit. 4AM was going to come quick! Like a trooper Quinn wasn’t too hard to pursued out of bed when that alarm went off. Her Brother, on the other hand, was still feeling a bit under the weather and asked his Mom to stay at camp with him, so he could sleep a couple more hours. Regina was hesitant but agreed, knowing she would worry herself sick about him if she didn’t stay. Nonetheless, Tom and Quinn were in the truck and ready to make their way back up those steep mountains well before daylight. Once at the top of the mountain, the sky started to lighten and we heard that tell tale trumpeting sound of a bull elk bugle. It was one of the very few bugles we had heard the entire trip and it definitely grabbed our attention. Sure enough there was a small herd of elk in the distance on the private property bordering the National Forest. We sat for quite awhile watching the herd through the spotting scope in hopes they would cross over the invisible boundary line. Suddenly, I could hear the sound of hooves moving through the trees just below us. Quinn and I moved as fast as we could along with the sound trying to catch a glimpse of what we were hearing in the draw, but before we could put our eyes on anything, the sound made its way into the dark timber. Our morning hunt was over just as quickly as it started. The full moon and warm weather was definitely not in our favor. 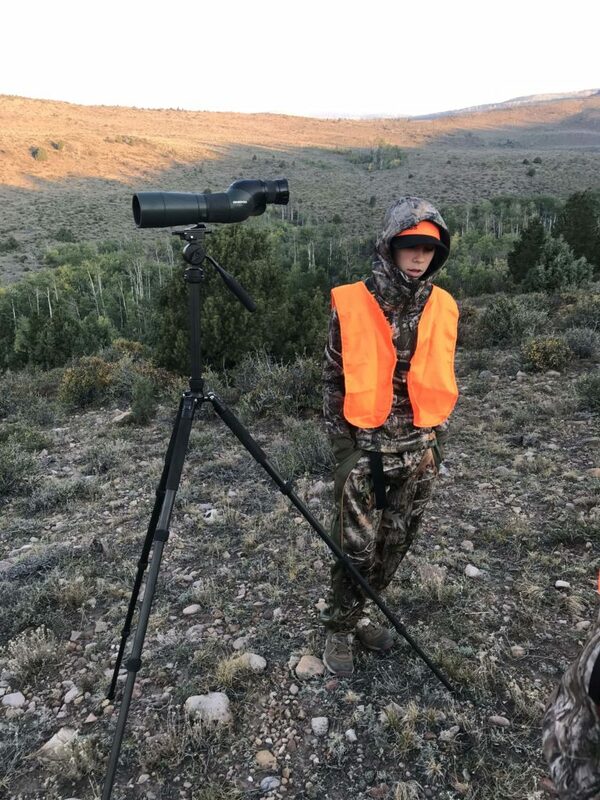 On our way back to camp, Tom spotted a couple cow elk on the public side of the fence, but Quinn was quick to remind us that she had no interest in shooting a cow, so we headed back to camp to finish breaking down Cade’s bull and getting the meat in the coolers. We also caught up on our rest with a little afternoon nap. There were a few new areas I had marked on the map that I was thinking we would try to hunt that evening. The discussion of which one to head to was cut short when Quinn made the decision for us! “We need to go back to where we have been seeing the elk!” The road into where we had been hunting was rough, both on the truck and passengers, but her wish was our command and we made the hour and half trek slowly to a new glassing point in that same area. The temps had dropped that evening and the wind was blowing about 25mph across the top of that knob. It was definitely chilly but I knew it was only a matter of time before one of us spotted an elk. My only worry was if it would happen with enough daylight left to do something about it. As if on cue, Tom whistled and pointed up hill to a small herd of elk feeding into an opening. The distinct tan coat and white shine of the antlers of a bull elk turned broadside was like a billboard with Quinn’s name on it! The race was on. Regina and Cade stayed back to be our eyes from a distance, while Tom, Quinn and I tried to close the 800 yard gap. We hustled up hill to within 500 yards. The wind was howling and we knew it would have some effect on Quinn’s shot, but 500 was as close as we could get. We were running out of light quickly and Quinn was confident she could make the shot, so we got her set up and ready. Tom got setup behind the spotting scope and picked out the bull. I helped Quinn to steady her rifle on the shooting sticks and find the bull in her scope. As soon as she got settled on the bull and clicked her safety off, the bull moved out of sight into a patch of dense brush. Regina and I could text each other with the little sliver of cell service we had. She could see the bull in the thick brush from her vantage point, but we could only catch glimpses of his antlers. We sat hoping and praying he would come out in the open. Regina and Cade were saying their own prayers too, anxiously awaiting the crack of Quinn’s rifle. Shooting hours slowly faded into darkness and a shot still hadn’t presented itself. There was nothing left to do but back out and hope we could find them in the morning. It was a quiet ride back to camp. Everyone was lost in their own thoughts about the events of this entire hunt. Over dinner that night, Quinn asked “do you guys think I just don’t have any luck?” We assured her that her time was coming. She was starting to doubt that it would happen and it broke our hearts. The morning came and no matter how hard we tried to pry Cade out of bed, it wasn’t happening. I felt bad for Regina. I knew she wanted to go with us, but we also knew that Cade wasn’t feeling 100%. It was for the best that she stay and let him rest. Tom, Quinn and I headed back up the hill to exactly where we left off the night before. We sat quietly on the knob in the dark waiting for daylight and listening. It was dead calm. Not even a breeze was blowing. Before it was light enough to see, our ears could pick up the creaking and crackling sound of elk walking over rocks. The sound was coming from the exact same patch of brush the bull had fed into the night before. They hadn’t left! We made our way to the exact 500 yard position we had set Quinn up in the night before. As the sun began to light up the morning, we could slowly start to see the elk milling about the hillside. At first we could only see a couple cows, then a spike bull appeared!!! Quinn quickly got him lined up in her scope! I ranged him and quickly dialed the turret on her scope to 375 yards. Just as she lined up her crosshairs on that spike bull, a branch antlered bull stepped out above him. Change of plans! 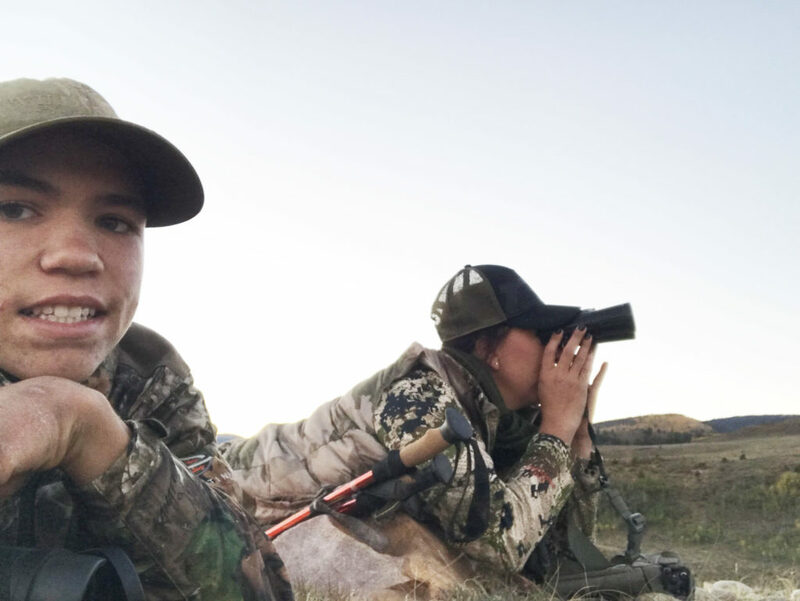 I ranged the bigger bull at 500 yards and Quinn quickly adjusted her turret and reset her crosshairs on the shoulder of the bull. The boom of her .280 Ackley was followed by that recognizable echo of a solid impact. Tom watched through the spotter as the bull took a few steps and the went back to feeding! What the heck?? We both heard the hit, but that bull wasn’t acting like he had a bullet right through his shoulder and Tom couldn’t see any blood on the bull. I quickly instructed Quinn to shoot again. She settled in for another shot and after a quick fire fight of a couple more rounds, a high shoulder shot was game over for the bull as he made it only 20 yards then tipped. Now I would be lying if all hell didn’t break loose after that bull dropped dead. Tom and I may have been more excited than Quinn, but regardless we were all on cloud nine or maybe even ten! High fives, hugs and happy dances ensued. 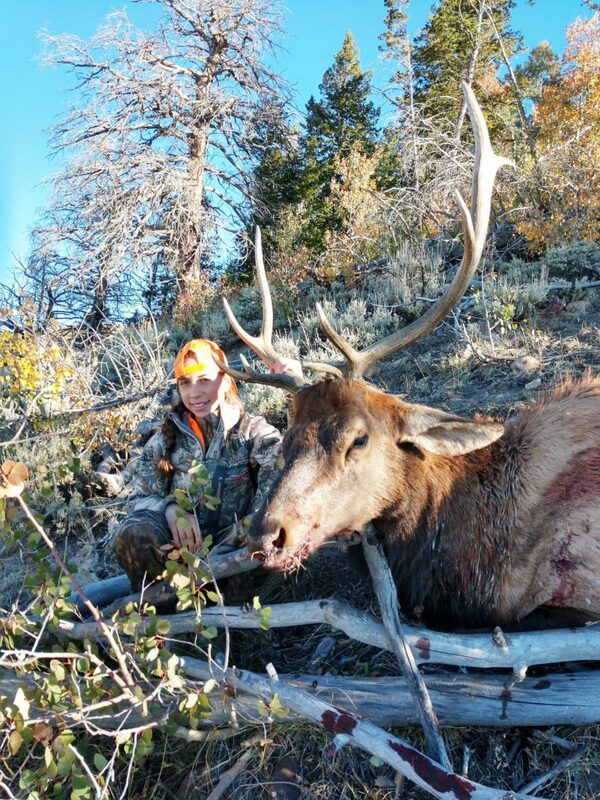 Quinn had just taken her first bull elk at 500 yards! A shot most adults don’t have the confidence to or skill to take! I was one proud Dad! We gathered our senses, unloaded all the unnecessary items from the packs and made our way up the hill to her bull. It took us a half hour to get to him. It was a pretty good pull up a nasty rocky trail. I’ll never forget the look on her face as she walked up to him. 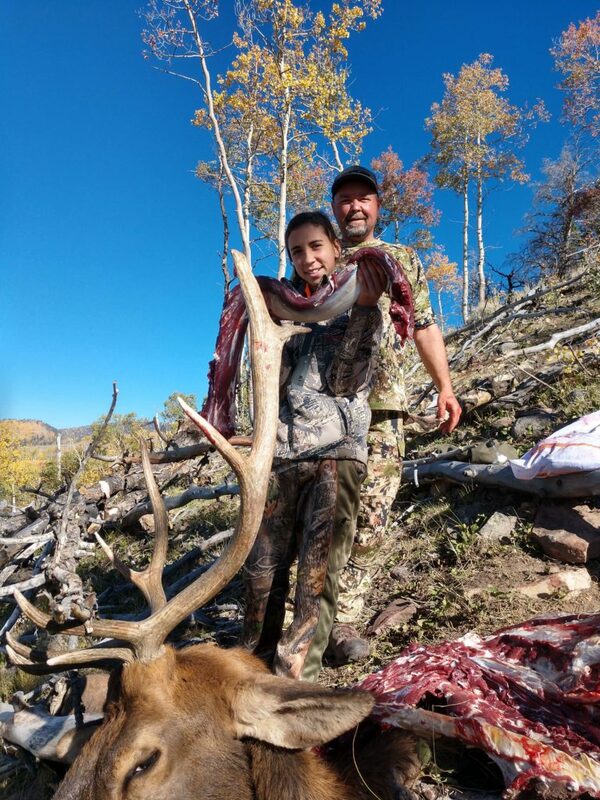 She looked tiny next to the big guy and as she grabbed at his horns she was all smiles to see his 5 points. Bigger than her Brothers and a great first bull in anyone’s book! We sent a text back to camp, not really expecting for it to go through, but just in case we were covered in that department. I still have no idea how, but that text was quickly replied to with a phone call from Quinn’s Mom! Regina was ecstatic on the other end of the line and Cade was chiming in too. After photos, the real work began and Quinn was a huge help in the breakdown of this bull. Tom and I worked each side of the bull removing quarters, backstraps, loins, and neck meat, until all that was left was to skin the head for a euro and get off that mountain. For some reason that rough rocky trek back felt like a paved highway. We must have all been ramped from the high of that morning. We loved filling Regina and Cade in on the details when we arrived back at camp! Of course, we had to razz Cade a bit about being a wimp and missing out on the pack out. In all honesty this hunt was in no way easy and these kids showed how tough and driven they are. 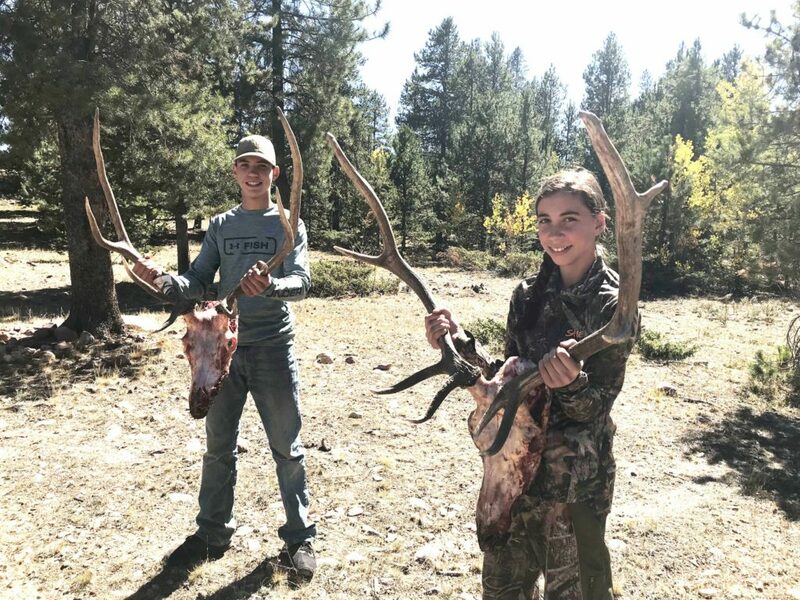 They stuck it out through the highs and lows both physically and emotionally of a public land diy hunt. They learned a ton of valuable life lessons. How to be relentless, persistent, patient, humble, appreciative and most importantly, how to grind and dig deep! A memory of a lifetime for this family! We really are blessed!